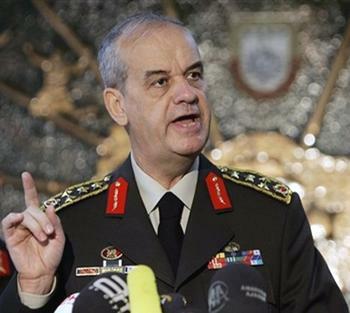 General Ilker Basbug, Turkey’s former armed forces chief, has been jailed for life for plotting to overthrow the government, after five years of trials involving officers, lawyers, writers and journalists. Gen. Ilker Basbug was among dozens of people convicted of involvement in the so-called Ergenekon plot. Critics of PM Recep Tayyip Erdogan have accused him of staging show trials to eliminate his enemies. His supporters say the trials have pushed the military out of politics. Verdicts are being read out one by one at a specially constructed courtroom in Istanbul. Twenty-one people have been acquitted and some 40 convicted so far, including at least one journalist and a police chief. Ilker Basbug, who led the military between 2008 and 2010, had rejected all the charges against him. The plot allegedly aimed to topple the government led by Recep Tayyip Erdogan’s Justice and Development Party (AKP). The defendants faced charges ranging from membership of “Ergenekon”, an alleged underground terrorist network, to illegally possessing weapons and instigating an armed uprising against the AKP. Prosecutors had demanded life imprisonment for Gen. Ilker Basbug and 63 others, including nine other generals. The court is sitting at the high-security Silivri prison complex, west of Istanbul, where the general is being held. Hundreds of riot police fired tear gas to disperse some 1,000 protesters who were marching outside the courthouse, reports say. The case is being seen as a key test in PM Recep Tayyip Erdogan’s showdown with secularist and military opponents. Since Recep Tayyip Erdogan came to power in 2002, hundreds of military officers – serving or retired – have been arrested. Critics say there is little evidence for the charges and accuse the government of trying to silence its secularist opponents. Critics have complained that the Ergenekon investigation has focused on opponents of the AKP. The government denies any such motive. Turkey’s military has long seen itself as the guarantor of the country’s secular constitution. It staged three coups between 1960 and 1980 and has a history of tension with the AKP. The AKP is considered a successor to the Welfare Party, an Islamist party that led a 1996-97 government forced to resign by an army-led campaign.